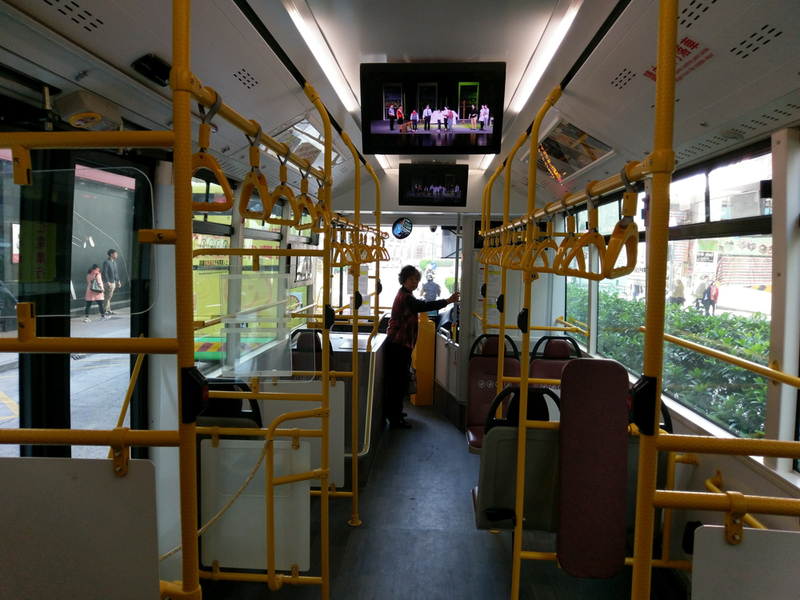 Buses are the best way to get around Macau – with options of free Casino shuttles, or the extensive public bus network. You might need to get up close and personal during busy periods – but that all adds to the experience. One way to get around Macau and Cotai for free, and in relative comfort is to use the Casino shuttle buses. They are free to use – just hop on board at the pick up points (or queue up at busy periods – the Casino shuttle bus terminal outside the Venetian can look like a cattle market during Chinese New Year). They are available at each main Casino, and also at the Ferry Terminals and Border Gates. Each Casino has its own branded buses – which will shuttle between the ferry terminals, border gates, and other casinos in the same group (for example – you can transit between the Galaxy Casino and Starworld, or between Sands Casino and the Venetian or Parisian, or various other combinations). The seats are comfy, large and you can put your luggage in the hold. They are laid on for free in the hope you will spend some time (and money) in the Casino, and watch their promotional videos on the trip (both of which you are not obliged to do). They are a great way to get about – the only limitations are that they will obviously only take you between Casinos, and only on their schedules (which are frequent, but not as frequent as the buses). This is fine if you want to visit the Casinos themselves, or sites close to the casinos. The Grand Lisboa and Starworld are all within easy walking distance of the Historic Centre of Macau, and the Galaxy Casino is a short walk from old Taipa Village. Macau has an excellent (if a little crowded at times) bus service. 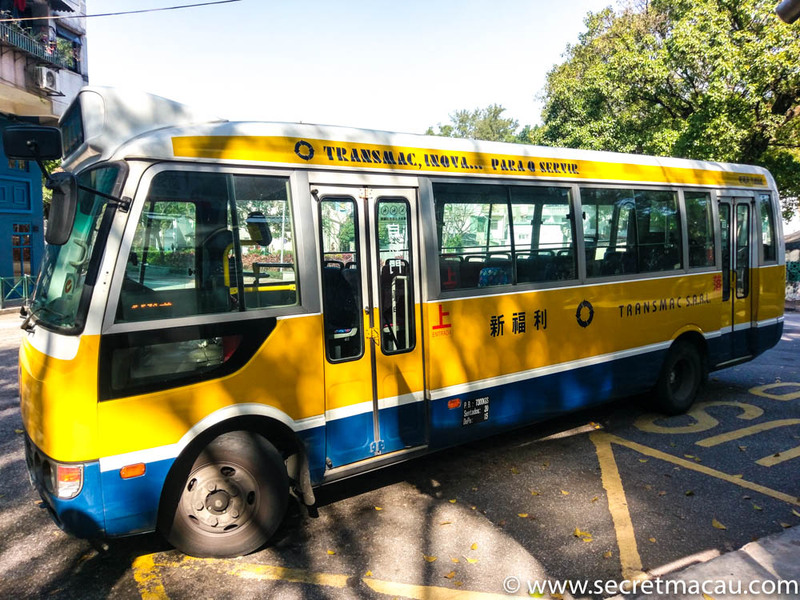 Macau buses are regular, stops are plentiful and routes cover the Macau peninsula, Taipa and Coloane. There are a number of different companies, operating two different types of buses. 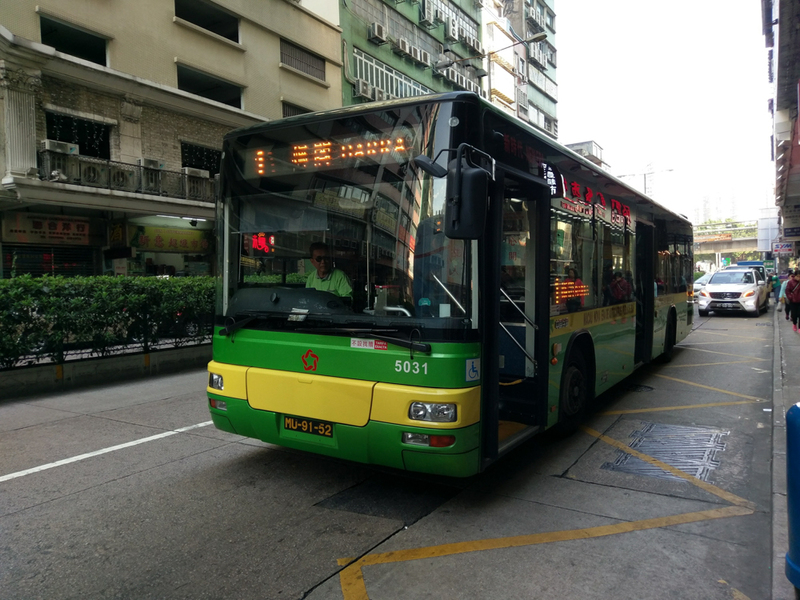 The larger buses are used on the majority of routes, while smaller, more minibus style buses cover routes that the larger ones would have difficulty getting round (on some of the tight streets in Macau in particular). The bigger buses are more spacious and comfortable, but the smaller buses are more intimate (and fun – they have a bounce factor the larger buses lack). Both can be equally crammed at busy times. When on the buses, each stop is displayed on an electronic screen on the bus, with an automated announcement in Chinese (Mandarin and Cantonese), Portuguese and English. The bus stops themselves display signs in Chinese and Portuguese. If you plan to use the buses, although they are easy – it would pay dividends to do a little research before you go on key routes and stops. Bus stops are largely a free for all. Just stand close to the bus stop along with everyone else, flag your bus as it approaches and just squeeze into the bus when the doors open. Don’t be shy – just maneuver into the flow and don’t let anyone squeeze in front of you (it’s entirely expected, and really quite orderly). 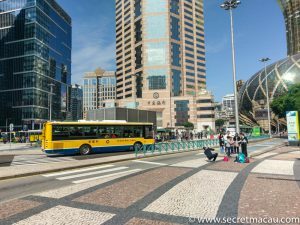 When I first visited Macau I would defer to women and older people when getting on the bus (my wife quickly cured me of that within a couple of days). Normally bus stops are shared by multiple routes – so not everyone hanging around at the stop will be getting your bus (so not to worry if there is a big crowd there already). Buses are the best way to get around, and 90%+ of the time is hassle free and fun. If you are visiting at a busy time (like Chinese New Year) – be prepared for longer waits and a tighter squeeze. If you plan your routes and timings (and especially if you don;t mind adding in a bit of walking), you can avoid most of the worst carnage. You pay on entry to the bus at the front door (and incidentally – always exit by the rear door). There’s a payment box with a card reader by the entrance. You either press your MacauPass card on the reader (MacauPass is a pre-paid travel and payment card – which you can pick up in 7-11s among other places – you need to buy them pre-loaded with a certain amount), or just drop your change in the coin box. Make sure you have the correct change (or more) as the driver will not give you any. He will look at the money when it drops in the box and determine if it’s enough (I think you can slip notes in there if you have no change – the ‘no change given’ rule still applies). 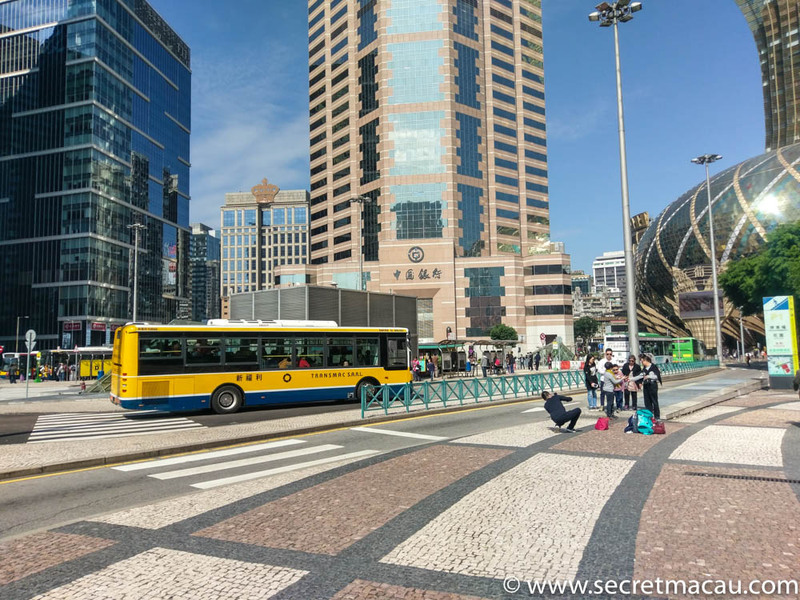 The main bus terminal in Macau is the ‘Praca de Ferreira do Amaral’ – which is a large open terminal just outside the Grand Lisboa and Casino Lisboa. 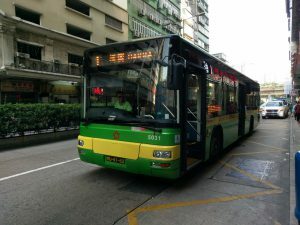 Macau Buses 26, 26A and 50 go direct to Coloane village (Vila De Coloane). 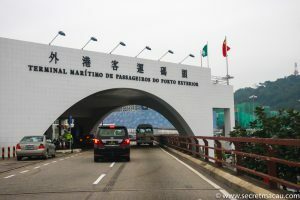 50 is a fairly direct route between ‘Praca de Ferreira do Amaral’ and ‘Vila De Coloane’ – which skirts the side of the Cotai Strip (you can stop at the Wynn Palace here). 26 terminates in Coloane village, 26A continues a bit further to Hac Sa Beach. 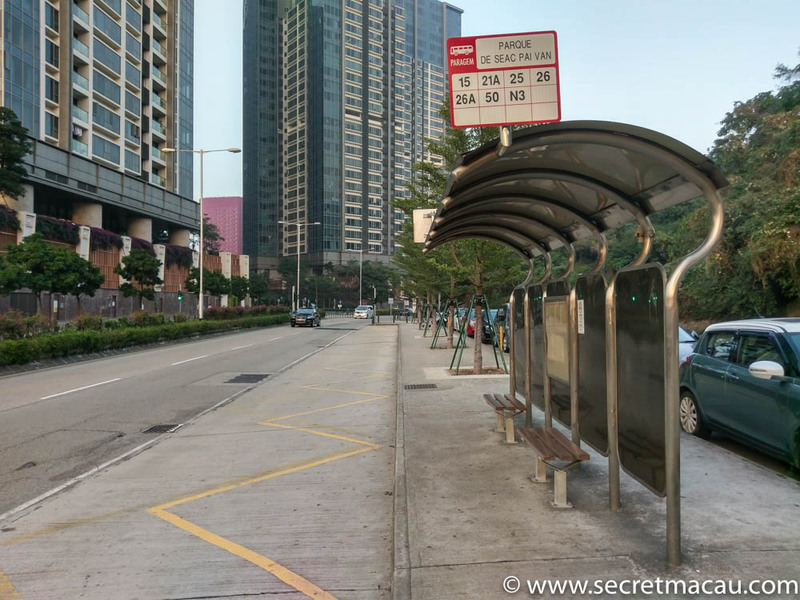 Both 26 and 26A stop on the Cotai Strip also (City of Dreams and Sands Cotai Central). All stop at various points in Taipa, and also at Parque De Seac Pai Van (to see the Panda’s and get the Shuttle bus up the hill to the A-Ma Cultural Village). There are, of course – a myriad of other routes to get around the peninsula. This website includes bus routes for each attraction. 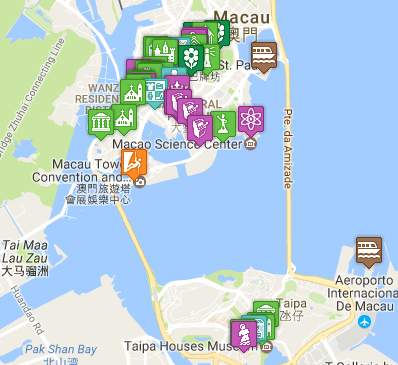 If you do a bit of preparation beforehand, and pick up a Macau Pass card – you can hop on and off the buses all day. And remember – Macau isn’t that big – if you don’t mind walking, a lot of attractions are easily walkable.